Ketosis is a metabolic state where your body burns fat instead of carbs for fuel. In many individuals being in ketosis leads to rapid and substantial weight-loss. Why would you want to be in ketosis? Being in ketosis and following a low-carb, ketogenic diet turns your body in to a fat burning machine. That means you get to eat delicious foods like: cheese, charcuterie, eggs and bacon while losing weight and feeling great. Best of all? Many people in ketosis experience greater satiety- which means they feel fuller, faster and are less hungry overall. You heard that right – you get to eat delicious foods while losing weight and feeling full. It’s a no brainer! Generally it takes healthy individuals up to a week to achieve ketosis. But good news – there’s ways you can speed up that process so you can get in to ketosis, faster. Stick to the keto diet. Limiting your carb intake is crucial in order to be in ketosis. While some individual are able to consume up to 50 carbs per day, you should stick to 20g net carbs or less. If you find that you are not reaching ketosis, consider counting your carbs or calculating your macros. Fasting depletes your body of carbs and calories, making it easier for you to get in to ketosis, quickly. MCT oil, also known as medium chain triglycerides (MCT’s), are naturally occurring fatty acids found in coconut or palm oils that enhance ketone production, More than 62% of the fatty acids in coconut oil are MCTs. But start slow – it’s best to be conservative and add only 1-1.5 tsps and work your way up to avoid a laxative effect. Achieving ketosis can be difficult for vegans and vegetarians, as many keto favorites like eggs or dairy are not an option. For those that follow a meat-free diet it’s best to rely on high-fat, plant-based sources of healthy fats like coconut oil, avocados, seeds, nuts and vegan meat replacements like tempeh and tofu. Is ketosis bad? And is it safe? 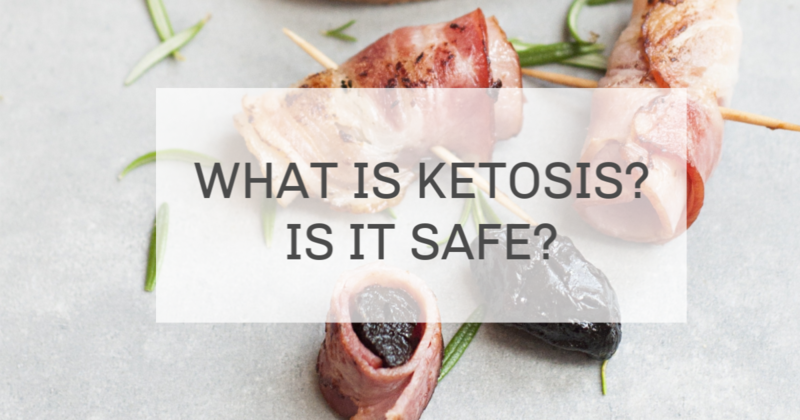 If you’ve been around the interwebs, you might have heard that being in ketosis is scary or even dangerous. That couldn’t be further from the truth, because nutritional ketosis is very different from ketoacidosis. Diabetic ketoacidosis, or DKA for short, is a serious and life-threatening medical condition usually associated with, you guessed it- diabetics. Nutritional ketosis is a natural metabolic state that was a survival mechanism during times of low food availability. Nowadays it can be achieved by most healthy individuals through the ketogenic diet and/or intermittent fasting. Blood glucose and insulin levels are usually markedly improved, even for healthy individuals. Ketoacidosis (DKA) is a rare yet potentially fatal complication of diabetes that produces a dangerously high level of ketones in the body – turning it acidic. It occurs when the body can’t create enough insulin, and can also be detected through ketone urine tests and or blood tests due to dangerously high elevation in blood sugar levels (hypoglycemia).